The Robo Wars Christmas Bash ! 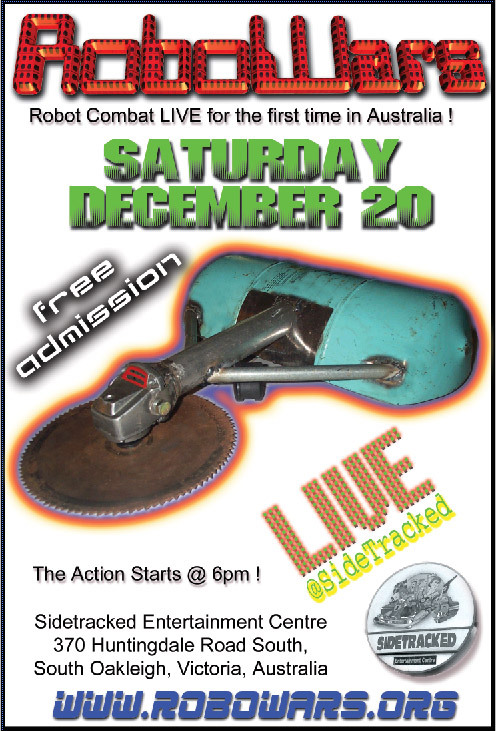 "Imagine two weapon-equipped machines bent on destruction being unleashed upon each other in a bulletProof arena with no mercy given or expected - Two Robots enter, one Robot and a pile of Scrap leaves..."
Saturday the 20th of December, at SideTracked Entertainment Center, In Oakliegh (www.sidetracked.com.au), the first Australian Combat Robot Event with a fully-enclosed Polycarbonate Arena will happen ! This rapidly-growing Worldwide Tech-Sport is one of the most exciting Live Spectacles of Mechanical Mayhem you will ever see ! The event is being heavily promoted and offers *free* admission to the public, so we expect a large audience will be there to watch the bot's wreak havoc. Arrive Early to be assured entry !. Video Production is definite, TV and Newspaper coverage is highly likely. Prizes and Trophies are up for grabs. Victory and Fame could be yours ! The venue is fantastic, with full public facilities in house, Food, Toilets, Video Games, Car Parking, Indoor Go Karts, LaserForce games, MiniGolf, a seperate competitors pit area, 2 minutes walk from the nearest train station, a metal scrap-yard next door (for those emergency repairs), a Bunnings hardware just down the road. The Arena is over 7 meters square with a steel floor and 2.4m high roof, and two walls with full-width 1.2meter high polycarbonate windows offering plenty of viewing arena for the public, with front-row seating available, and ample standing room behind. A seperate "Drivers" box will be located on the opposite side of the arena for the competitors to operate the bots from. Can I Compete ? - Yes ! - RoboWars is open to everyone ! Hobbyists, Students & Uni’s to Father & Son Teams The Robots range from 6Kg Hobbyweights up to 100Kg Heavyweight beasts to suit your Skills and your Budget. Combining Engineering, Learning and Design Skills and Heart Pounding yet safe Violent Competition, this is a sport for anyone who likes to build machines and compete. If you have a bot (or are building one) and would like to enter the competition, please contact events@robowars.org ASAP to confirm your entry. Limited Front-Row Reserved Seats may be booked for just $5, guarranteeing you a ringside-spot for the entire event. Standing room spectating behind the front-row seats is free of charge. Contact events@robowars.org if you would like to reserve a seat. First come, First Serve. We will be initially running the 12Kg class (Featherweight), with some demonstration matches from some of the larger 25/50/100Kg robots as a finale to the event. Arrival, Regsitration, Tech Inspection & Drivers briefings will begin around lunchtime. Combat rounds will start mid-afternoon, and will proceed into the evening as required. First Prize for the Featherweight winner of the event is an I.B.C. Controller worth over $300 ! This is probably one of the most sought-after components of featherweight robots, offering precise, reliable speed and weapons control. A prize worth battling over indeed. More Prizes for the runners up willl be announced soon. If you would like to be emailed with updates on the sport of Robotic Combat, just add your name to the email list from the home page button.